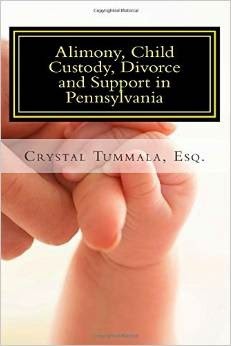 Today we are interviewing Crystal Tummala about her book, Alimony, Child Custody, Divorce and Support in Pennsylvania. I am licensed to practice law in Pennsylvania. I am the owner of the Pittsburgh based, Tummala Law Office. I earned my Juris Doctorate degree from the Duquesne University School of Law. I am a member of the Allegheny County Bar Association and the Family Law Section. This is my second book. My first book was inspired by the wisdom and business success of my grandmother. It is entitled Grandma's Wisdom For Business and Life. What inspired you to write a book about divorce, custody and support? I wanted to offer an informative resource for those faced with issues of Alimony, Custody and Support in Pennsylvania. What do you think is the most difficult thing for people facing the legal issues related to divorce or custody? To put aside their emotions of fear and pain and to try to focus on wise long term solutions. You emphasize in your book different ways for individuals to keep anger and fear under control during the process. Why is this so important? Fear and pain can cause us to make impulsive decisions that may not be good choices. This book will serve as a resource to inform the reader and I believe information is power. I am looking to write a book that encourages celebrating life. Is there anything else you’d like to tell potential readers? If you are faced with any of these issues I truly believe this book was meant for you.